Lower Hutt War Memorial Library, corner Queens Drive and Woburn Road, Lower Hutt. 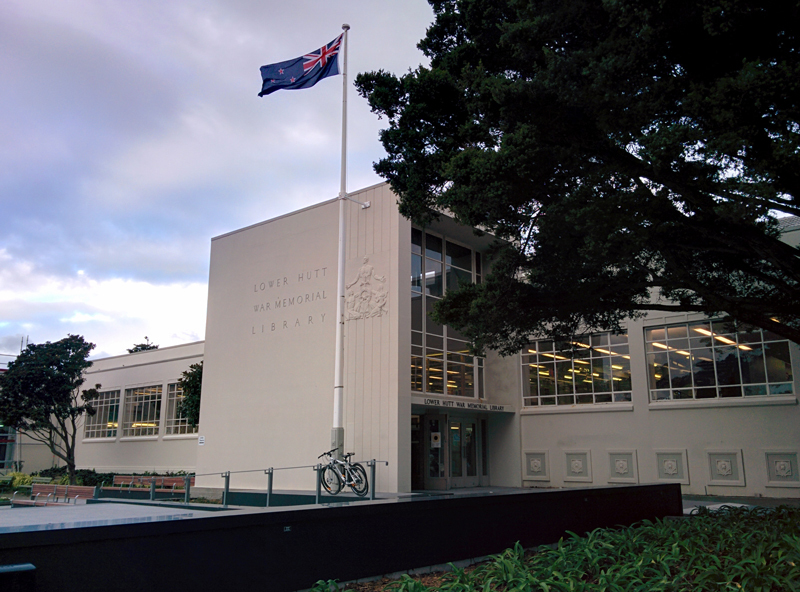 The Lower Hutt Civic Centre is comprised of four buildings, St James Church, the Town Hall, the Horticultural Hall and the War Memorial Library. The Library was designed by Ron Muston and opened in 1956. 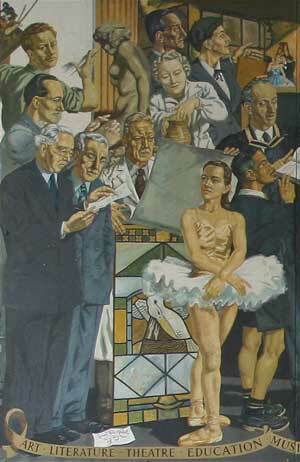 In October 1955 Ron Muston commissioned Len to paint three murals for the Library, two for the Memorial Hall, the main entrance to the building, measuring 20 feet tall by 14 feet wide(approximately 6 metres by 4.2 metres), and a third to be hung above the main desk, measuring 8.5 feet tall by 28 feet wide (approximately 2.5 metres by 8.5 metres). 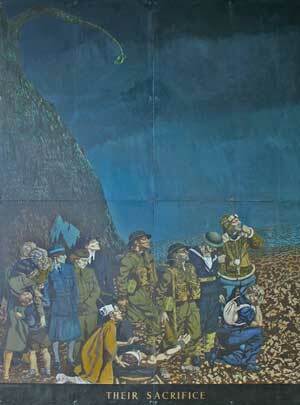 They were the largest murals ever to be commissioned in New Zealand up to that time and Len was faced with the daunting task of designing and completing the murals within three and a half months. The murals still take pride of place in the Library today although, as part of renovations, the largest mural Human Endeavour (above) no longer hangs above the main desk. Their Sacrifice and Preserved Freedom in the main entrance foyer (Memorial Hall), viewed from the library interior. The original brief was for the murals to be painted directly onto the walls but Len was adamant they be done on canvas, he wanted his work to be of a lasting nature, and had concerns around earthquake risk and maintenance. 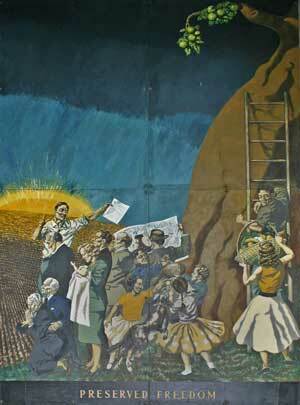 Len's wish was enventually granted on condition that the building contractors, W.M. Angus Ltd., make up the frames to precise measurements laid down by Ron Muston. However, the wait for the frames cut severely into Len's time with them only arriving in December. The Library was scheduled to open on the 28th of February. Len's brother, Frank, undertook the huge job of covering the frames which he did using a heavy linen fabric treated with copper to ensure long life and imperviousness to water damage and light. Len worked day and night to complete the commission on time, giving them up for delivery to the Library on the 24th of February. Len, Frank and their father, Leonard Cornwall Mitchell, worked all weekend to install the murals and complete the lettering. Once the panels were installed above the main desk, a ribbon had to be painted to tie the five panels together as one work. This task, which couldn't be done until the panels were finally installed, was completed by Len's father. The official opening was set for the afternoon of Tuesday 28th February and Frank recalls that Len was still hard at work, up a ladder, as the first guests started to arrive. It had been planned to hold the ceremony outside but due to the unseasonably wet day it was decided to move everyone inside.